Lynn DeVries has more than 15 years of professional freelance writing experience with projects ranging from marketing copy writing to entertainment journalism. She researches and writes about alternative therapies on the Web site Medicinal Herb Info and writes for eHow Home & Garden and LIVESTRONG. Lynn is fond of learning and writing about alternative therapies, the latest gadget, or technology. Can I Take L-Arginine and Ginseng Together? Can You Take Dandelion Tea and Milk Thistle? The dandelion is also known as a "blow ball,""lion's tooth," or its scientific name, Taraxacum officinale. According to the University of Maryland Medical Center (UMMC) web site, these herbs are rich sources of nutrition including vitamins A, B complex, C, and D and the minerals iron, potassium, and zinc. This alone is good reason to add a few dandelion leaves to your salad. However, before starting the medicinal use of dandelions, be sure to consult your health care provider. The UMMC site says that traditionally, both the roots and the leaves of the dandelion were used to treat liver problems. But these days, the roots are more commonly used to aid digestion, increase the appetite and improve the functions of the gall bladder and the liver. The dandelion's leaves are most commonly used as a natural diuretic to help the body get rid of excess water from bloating or swelling. The U.S. National Library of Medicine (USNLM) site also indicates that dandelion is used to treat these conditions: cancer, colitis, diabetes and hepatitis B. However, it also warns that not enough clinical study has been done to prove dandelion's effectiveness for treating these conditions. The USNLM reports that the medicinal portions of the dandelion include the roots, the leaves or the entire plant. The leaves are often added to salads or cooked greens and the flowers are even used to make dandelion wine. Dandelion can be found for sale as tinctures, capsules, dried or fresh greens or a liquid extract. Dandelion is often combined with other medicinal herbs in supplements. The USNLM says that dandelion is generally considered safe, but rarely it may cause an upset stomach, diarrhea or allergic reaction. However, the UMMC also warns that dandelion may harmfully interact with such medications as lithium, antibiotics, antacids or quinolone. This is why you should tell your health care provider about all supplements you use medicinally. 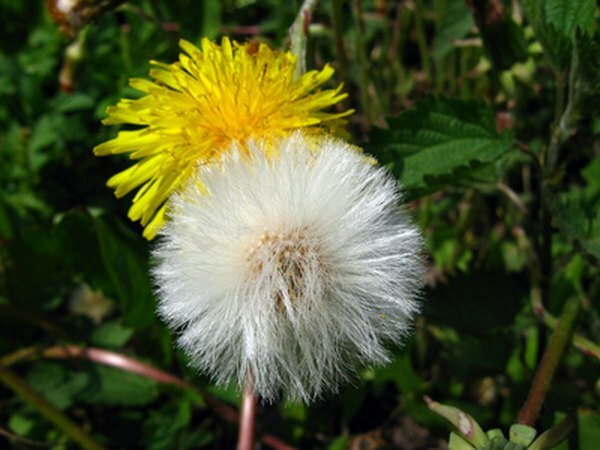 The Memorial Sloan-Kettering Cancer Center website describes several animal studies and a few simple human studies that have attempted to determine whether dandelion is an effective treatment. The herb seems to be helpful for lowering cholesterol, decreasing inflammation and stimulating the appetite, but much more study needs to be done before it can be recommended for medicinal use. Taking any new substance can cause an allergic reaction. If you notice a rash, hives or shortness of breath while taking dandelion, discontinue its use and contact your health care provider. Can I Use Passion Flower While Pregnant? Why Not Eat Raw Alfalfa Sprouts? Is Too Much Saw Palmetto Bad for You?